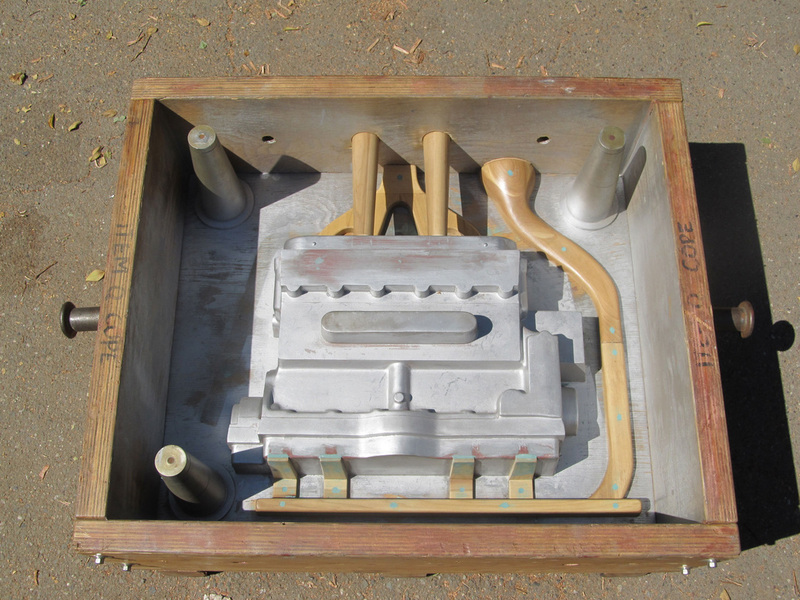 The last update was on 25 May 2012 with 16 castings poured. Since then, 5 additional castings have been poured bringing the total to 21. The first 4 new castings (#17, #18, #19, and #20) were poured with the parting line horizontal and they all had varying degrees of porosity. Castings #1 through #16 also had a horizontal parting line. 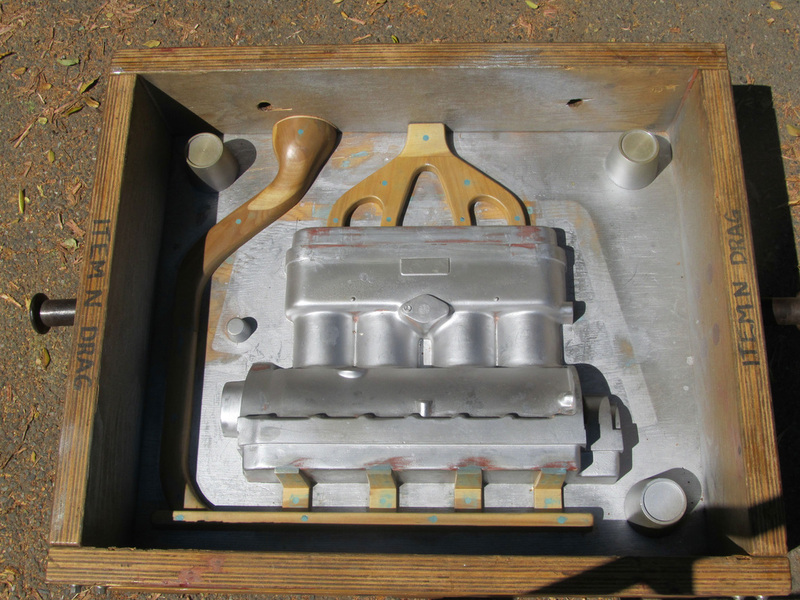 Ford poured cylinder block castings for both Model T and A with a horizontal parting line. The new Model A cylinder block casting has had an ongoing porosity problem in the wall where the intake and exhaust manifolds attach. When poured with a horizontal parting line, this wall is directly above the water jacket core and the glue line needed to hold the upper and lower water jacket cores together. This is also the highest part of the casting, the last void to fill, and the section with least “head pressure” from the pouring sprue. Many things can contribute to cause the porosity (lack of material) problem at this location. Causes include out-gassing of core binders, additional out-gassing of core binders if the resin/catalyst ratio for the water jacket core is not optimal, out-gassing of glue used to cement the water jacket cores together, inadequate venting that won’t allow displaced air to escape, and pouring too slow which can result in iron that is too cold from exposure to cores that is attempting to fill the mold. The last casting (#21) was different. From an engineering standpoint, it looked great with no porosity. From a cosmetic standpoint, it was a little ugly. Shortcuts regarding cosmetics were taken to save money while gaining engineering knowledge by trying something new. Many things that had been talked about in the past but never implemented were tried on casting #21. These include rotating the parting line from horizontal to vertical, adding the “mother of all vents” that allows the core assembly to vent directly to atmosphere, adding up-sprues (pop-offs) that vent to atmosphere and fill with iron to show that the mold is full, using the upper and lower core holders (parts of core assembly) to align the cope and drag instead of using the non-shift buttons, and filling the mold in a direction that provides more “head” pressure on the casting due to the pouring sprue being at a higher elevation. Since many changes were implemented on casting #21, it is impossible to determine the effect of each change. Much of the gating, venting, and up-sprues (pop-offs) mentioned above were hand cut into the mold for casting #21. With a vertical parting line, any outgassing from the water jacket core and glue used to hold it together has an escape path through the water passage holes from cylinder block to head. I met with Mike Frank (Mfg. Manager) at Lodi Iron Works to discuss casting #21. Mike was happy with casting #21 and requested several changes to the tooling that are necessary to change from a horizontal to vertical parting line. I am also very happy that Lodi Iron Works is thinking “outside the box” and experimenting. I am now working to implement those changes which include adding the “mother of all vents”, adding up-sprues (pop-offs), and changing the gating system from horizontal to vertical with a large pour hole that will introduce hot iron through 8 gates located at the bottom of the pan rails. Casting #21 was poured through 3 gates that introduced hot iron into one pan rail. Fit of the intake and exhaust port cores was also discussed, configuration control has been lost due to several requested changes to the port core box, and a decision was made to make a new core box going back to the original SolidWorks design. I have ordered new rapid prototyped masters that will be used to cast the new core box. The first attachment is a picture of casting #21. The second attachment is a picture of the drag. Changes to the drag include venting and gating which are shown in natural wood. The third attachment is a picture of the cope. Changes to the cope include venting, gating, and the addition of the up-sprues (pop-offs). I am cautiously optimistic that casting #22 will be good. The material used to cast these parts was Meehanite SP80 (80-55-06). This material is close to the material that is used for similar parts in modern engines. This material is also used for suspension parts and gears in new cars. 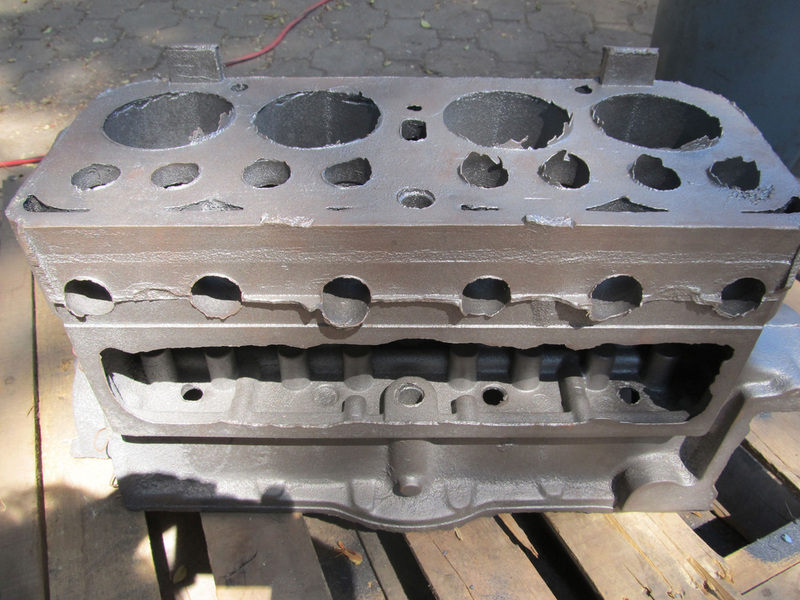 The next update will be in about 2 months or sooner if Lodi Iron Works pours a good cylinder block casting.